Calgary police are investigating a Saturday evening collision in the downtown core which disrupted Calgary Transit service and sent two people to hospital as a precautionary measure. At approximately 11:30 p.m., CFD crews, EMS and CPS responded to the intersection of 6 St. and 7 Ave. S.W. 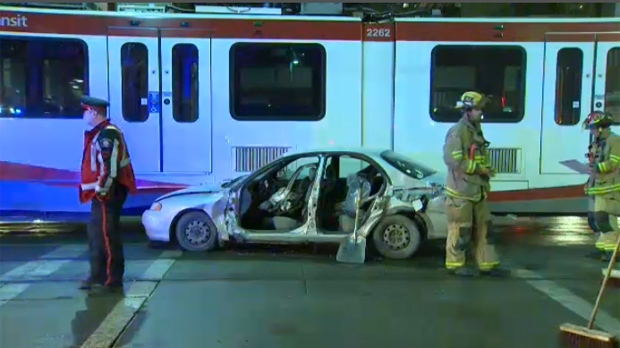 after a sedan struck the centre car of a westbound CTrain. On arrival, emergency crews discovered the two occupants of the sedan were trapped in the vehicle. Fire crews extricated the two adult women from the car and EMS transported the two patients to hospital in stable, non-life threatening condition.